I have been working with my four-year-old on his letter names and sounds for awhile. He knows most of them because he's had so much exposure to them in fun, creative, and exploratory ways. 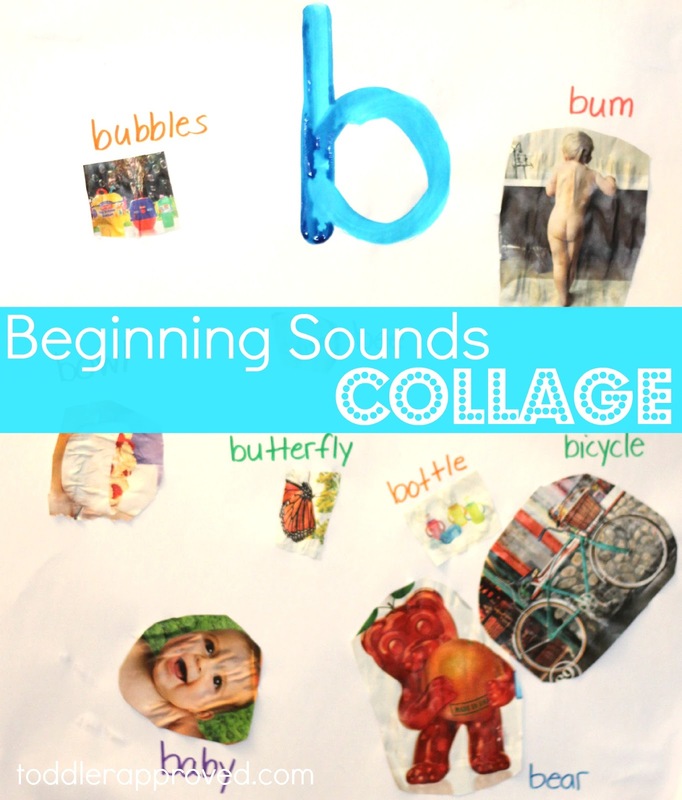 One way that we've both loved learning about beginning sounds is by going on a beginning sounds magazine hunt... and then creating a collage with the fabulous pictures we find. I think this activity is great for preschoolers and older toddlers. 1. Choose the alphabet letter you want to focus on for the activity. We chose B because that is the letter we are talking about this week. We sang our favorite letter names/sounds alphabet song as we got started and reviewed the sound that the letter b makes. 2. Go through a magazine together looking for pictures of items that begin the the sound you are hunting for. With younger kids they may need several reminders/prompts while you are looking to remember the sound that they are hunting for. With older kids like my son, this portion of the activity could probably be done independently, but I like doing it together to build on new vocabulary and spend time talking together. 3. Rip out magazine pages that have an object on them that starts with the letter you are hunting. For example, we ripped out bicycle, bottle, butterfly, bee, bubbles, bear, and baby, etc. 4. Have your child use scissors to help cut around the image. 5. Glue the images onto large drawing paper that is labeled with the letter you are hunting for. 6. Go through and talk about each image after it is added and have your child tell you the word to write by each picture. 7. Hang the collage somewhere your child can see it often. If you'd like, put a wooden dowel or some sort of pointer close by so that your child can go and read the words on the wall and point to each one as they read. Once your child understands beginning sounds, you could go on a middle or ending sound hunt using the same idea. 1. 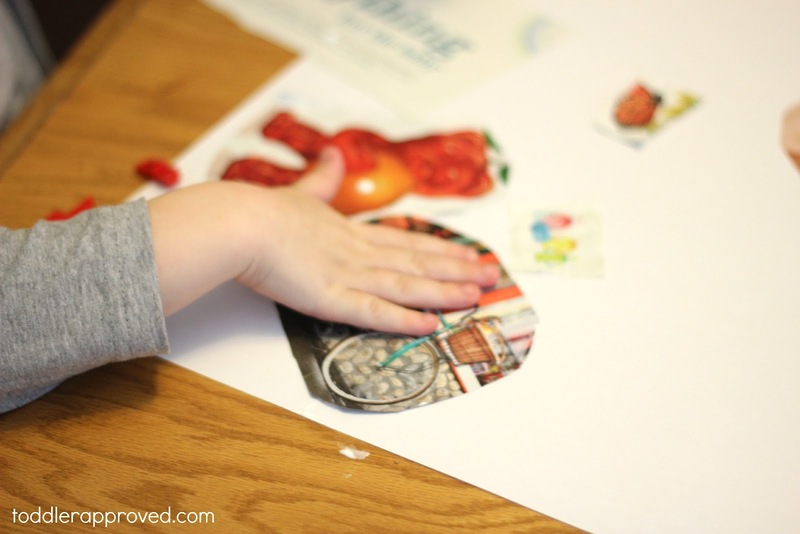 Have toddlers rip magazine pages and have fun exploring the pictures they see as they rip and tear... which is a really fun sensory experience. Once finished you could make a ripped art collage. 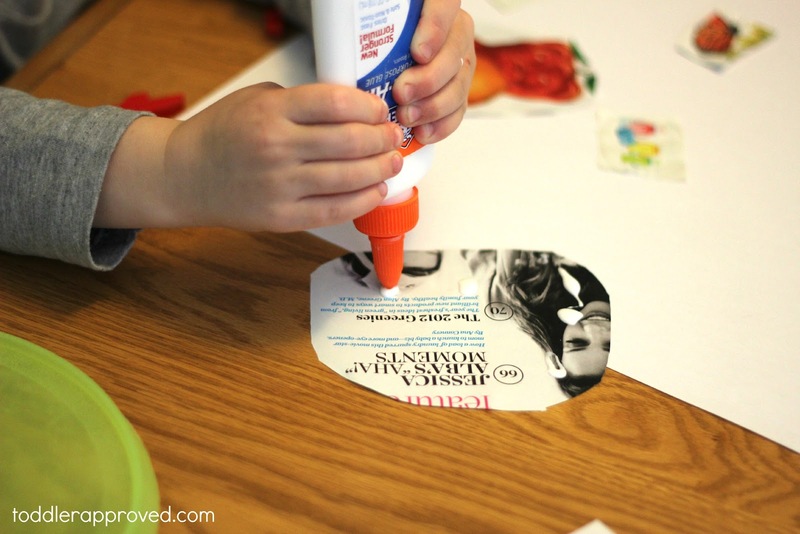 Pour glue on a piece of paper and have your child stick all the ripped paper onto the glue. 2. Look through magazines with your toddler and talk about the pictures they see. Label each picture while you talk and describe the pictures in simple phrases. Rip out pictures your toddler seems to love and have your toddler help you glue them into a collage. Hang the collage of pictures somewhere in your house where your toddler can reach and as they touch each picture, talk about it. If you want your collage to stay intact... laminate it! This is a great way to teach new vocabulary using your child's interests. 3. 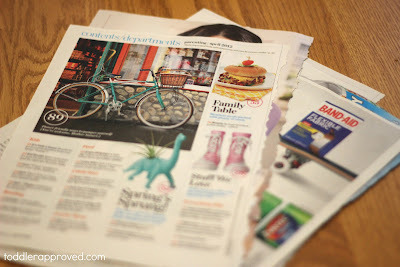 Go on a color or shape hunt with your toddler inside the magazines. Look for objects that are a specific shape or color and make a shape or color collage. For example, look for orange objects and then rip out only orange pictures. Work with your toddler to glue them onto a large paper and write the word orange at the top. Talk about and describe each picture. See if your toddler can say some of the new words too! This is a fun way to learn about colors (or shapes) and learn new vocabulary words! What other ways do you teach about beginning sounds? What are your favorite type of collages to make? what fun! especially the ripping part :) we do stuff like this in Bear's journal and he loves it too!